The simple underlying purpose allows this monastic training to be the basis for a lay moral code, albeit one that translates Right Action more simply to precepts you can count on your fingers. It thus allows for a close relationship between ordained and lay, one of symbiosis. Whilst the several formulations of Precepts reflect differing levels of commitment, they all share the common characteristics of being rules of training in body, speech, and mind designed to develop and purify moral virtue. They are obligations in the sense of a personal undertaking with a typical recitation of “sikkāpadaṃ veramaṇī,” meaning ‘I undertake the rule of training’. They are designed with the practical view of enabling spiritual flourishing at successively higher levels, since, as Harvey notes: “Virtue generates freedom from remorse and this leads on through gladness and joy to meditative calm, insight and liberation. 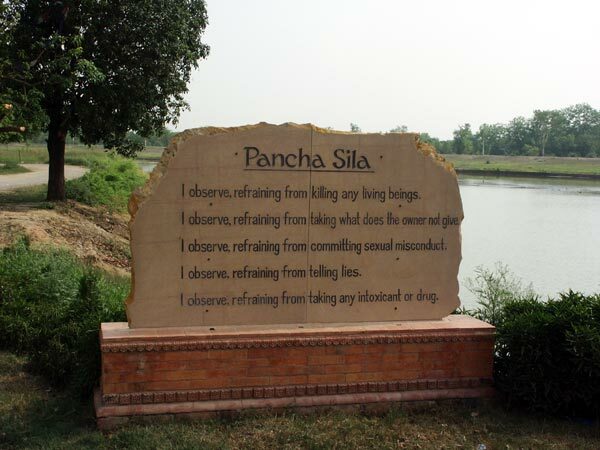 The most basic formulation of rules for lay followers is the pañca-sikkhāpada or five virtues (pañca-sīla), already mentioned as the Five Precepts. They are traditionally recited in the presence of bhikkhus, but nowadays are often conducted at home, perhaps in front of a shrine containing a Buddha image. 1. I undertake the precept to abstain from the taking life. 2. I undertake the precept not to take that which is not given. 3. I undertake the precept to abstain from misconduct in sensual actions. 4. I undertake the precept to abstain from false speech. 5. I undertake the precept to abstain from liquor that cause intoxication and indolence.